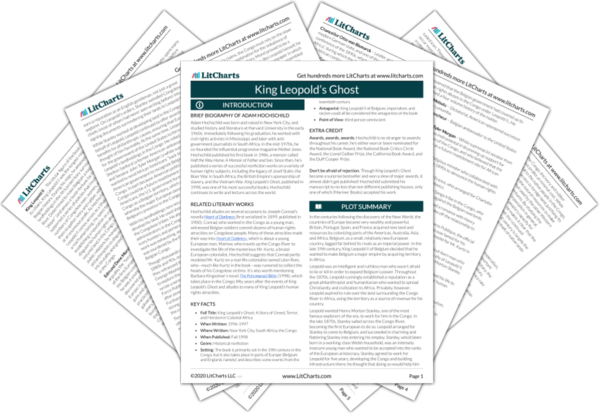 Instant downloads of all 942 LitChart PDFs (including King Leopold’s Ghost). 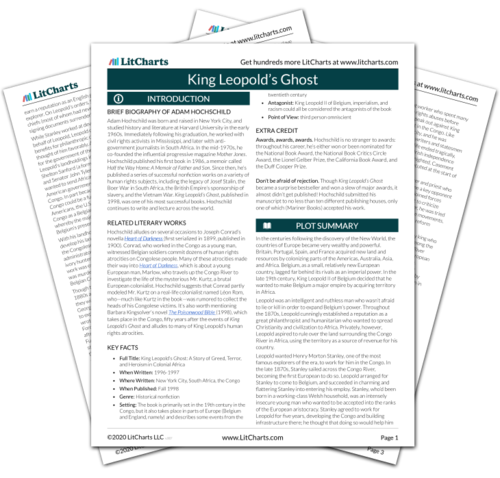 Welcome to the LitCharts study guide on Adam Hochschild's King Leopold’s Ghost. Created by the original team behind SparkNotes, LitCharts are the world's best literature guides. A concise biography of Adam Hochschild plus historical and literary context for King Leopold’s Ghost. A quick-reference summary: King Leopold’s Ghost on a single page. In-depth summary and analysis of every Chapter of King Leopold’s Ghost. Visual theme-tracking, too. Explanations, analysis, and visualizations of King Leopold’s Ghost's themes. King Leopold’s Ghost's important quotes, sortable by theme, character, or Chapter. Description, analysis, and timelines for King Leopold’s Ghost's characters. Explanations of King Leopold’s Ghost's symbols, and tracking of where they appear. An interactive data visualization of King Leopold’s Ghost's plot and themes. Adam Hochschild was born and raised in New York City, and studied history and literature at Harvard University in the early 1960s. Immediately following his graduation, he worked with civil rights activists in Mississippi, and later with anti-government journalists in South Africa. In the mid-1970s, he co-founded the influential progressive magazine Mother Jones. Hochschild published his first book in 1986, a memoir called Half the Way Home: A Memoir of Father and Son. Since then, he’s published a series of successful nonfiction works on a variety of human rights subjects, including the legacy of Josef Stalin, the Boer War in South Africa, the British Empire’s sponsorship of slavery, and the Vietnam War. King Leopold’s Ghost, published in 1998, was one of his most successful books. Hochschild continues to write and lecture across the world. 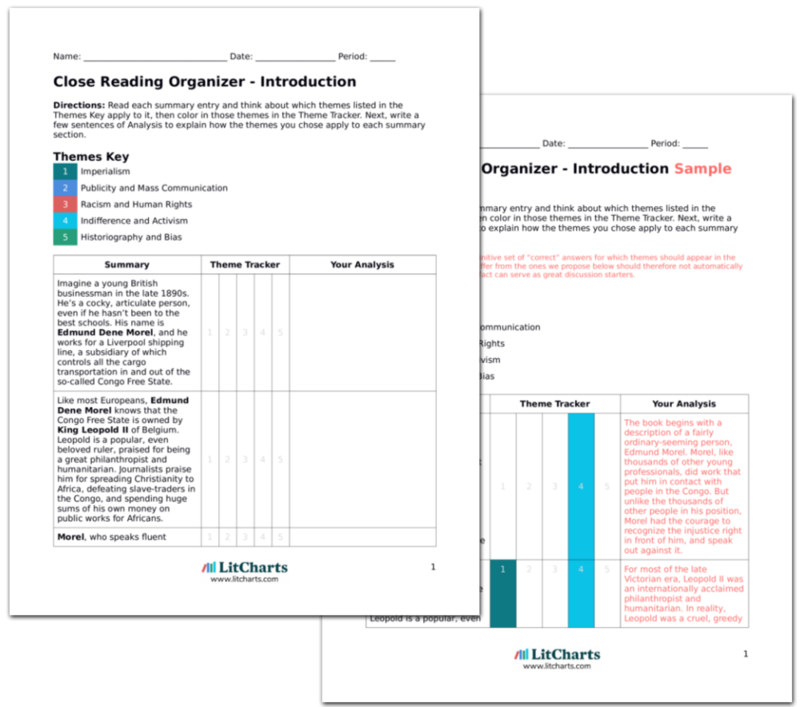 Get the entire King Leopold’s Ghost LitChart as a printable PDF. Hochschild alludes on several occasions to Joseph Conrad’s novella Heart of Darkness (first serialized in 1899, published in 1900). Conrad, who worked in the Congo as a young man, witnessed Belgian soldiers commit dozens of human rights atrocities on Congolese people. Many of these atrocities made their way into Heart of Darkness, which is about a young European man, Marlow, who travels up the Congo River to investigate the life of the mysterious Mr. Kurtz, a brutal European colonialist. Hochschild suggests that Conrad partly modeled Mr. Kurtz on a real-life colonialist named Léon Rom, who—much like Kurtz in the book—was rumored to collect the heads of his Congolese victims. It’s also worth mentioning Barbara Kingsolver’s novel The Poisonwood Bible (1998), which takes place in the Congo, fifty years after the events of King Leopold’s Ghost and alludes to many of King Leopold’s human rights atrocities. Awards, awards, awards. Hochschild is no stranger to awards: throughout his career, he’s either won or been nominated for the National Book Award, the National Book Critics Circle Award, the Lionel Gelber Prize, the California Book Award, and the Duff Cooper Prize. Don’t be afraid of rejection. Though King Leopold’s Ghost became a surprise bestseller and won a slew of major awards, it almost didn’t get published! Hochschild submitted his manuscript to no less than ten different publishing houses, only one of which (Mariner Books) accepted his work. Arn, Jackson. "King Leopold’s Ghost." LitCharts. LitCharts LLC, 17 Feb 2017. Web. 20 Apr 2019. Arn, Jackson. "King Leopold’s Ghost." LitCharts LLC, February 17, 2017. Retrieved April 20, 2019. https://www.litcharts.com/lit/king-leopold-s-ghost.